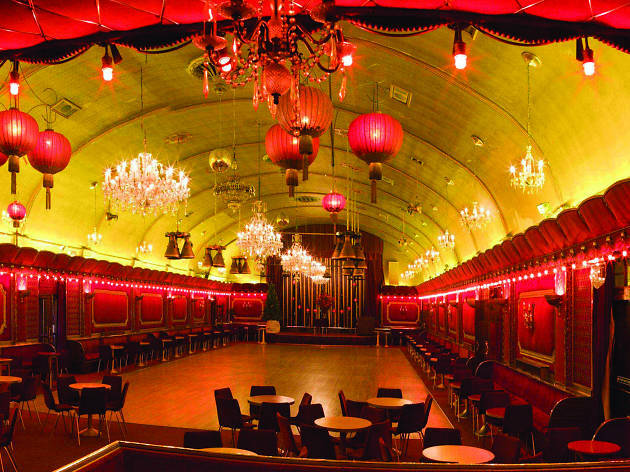 A lovingly restored 1950s ballroom, which is the only intact one left in London, deeming its art deco grandness Grade II-listed. 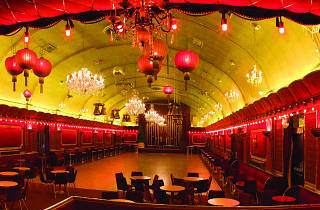 Went to the the unrivalled Rivoli Ballroom last night for one of their long running jive nights run by Jive Party. Not been for awhile but oh my goodness, it was just the best of nights. Ruby and the Dukes kept the dance floor full as did the DJs. It was packed but still room to dance. So lovely to see all the retro gear on display and the owners must spend an age maintaining all the decor, just wonderful. All the tables in the side bars were full of happy chatting groups, such a friendly crowd and friendly place. it was likely being in a 50's movie. I wouldn't have been surprised to see Michael J Fox make a brief appearance. Fully recommend these nights. Haven't been to the Rivoli Rouge disco nights, disco not being my thing, but I hear they are always a sell out too. The Rivoli is like stepping into a time capsule, the 50s ballroom is beautifully preserved and photos really can’t do the detail justice, I spent the first ten minutes trying to get a photo that captured the glamorous ornate features, but it has to be seen to be truly appreciated! It’s not just the interior that’s a spectacle, everyone there really gets into the vintage theme, with a mass of glamorous full-flared skirts, stockings, cropped sharp suits and polka dots a-plenty on show, and gallons of Brylcreem and hairspray perfectly set the bouffants and pompadour quiffs. The best thing perhaps is the dancing; the crowd display some fantastic retro dance moves, throwing out amazing shapes to the rhythm of the live band playing old 50s classics. It’s so much fun, whether you’re an experienced Lindy hopper or a beginner bopper, and even if you don’t want to get up and get involved, all of the jiving, jitterbugging and charleston footwork is greatly entertaining. The decor, the costumes, the dances, all elements amount to the makings of a post-war era good time. It’s exactly how you’d imagine 50s London to be, a place filled with merriment, celebration and exuberance. Everyone there looked like they were having the best time, the sheer enjoyment and upbeat attitudes were infectious and will turn any frown upside down. This was my third time at the incredible Rivoli Ballrooms in Crofton Park and, despite the epic journey for me, from North East London, I will certainly be coming again. I must admit, as a swing dancer, I've only tried the Jive Parties there and I know I ought to try another type of night, but these are so good! With a live band, spacious dance floor and a mix of experienced and new Jive/Swing/Lindy dancers it's a place for everyone of all ages. The drinks are cheap for London, the bathrooms are falling apart, but wonderfully retro (ladies check out the powder room attached) and the two side bars transport you into a 1950s movie. This place is well worth a visit with a bunch of friends and should be on your bucket list. So don your finest attire, sort out your ride (a.k.a Network Rail) and roll up for a night of fun, friends and fantastic dancing dressed in your vintage best! OH MY GOD THIS PLACE IS UNREAL! Even the pictures cannot do it justice, every corner you turn is a total treat for the eyes. You feel like you've stepped back in time, everything from the owner meeting you at the door and holding it open for you, his family running the guestlist, the 'ladies boudoir' complete with make up areas, the sandwiches sold wrapped in cellophane and all the hidden nooks and crannies- ERGH! SO GOOD! We went to a disco night run by Rouges which is monthly, it wasnt packed (but actually I liked that, loads of space for dancing) the music was great, the crowd was a nice mix and the atmosphere was very friendly. I will basically never go out anywhere else again, cannot recommend highly enough, find a night and book it up with a big group!